I have been meaning to do a book give away for ages. Here it is! I have three copies to give away, and all you have to do to enter is leave a comment here. I will do the drawing Monday! I don’t know if I have ever told you all this, but when this book was in the works, I felt very strongly that it needed to actually look like my life. I didn’t want any shiny family photos on the cover. Didn’t want any pretend about it. So, we looked through our old photos and found this one of Chloe. Fit the bill! Captured a little bit of reality. But not all of it. All of it was too much to look at. Because all of it was this: There are a lot of photos in this sequence. In some of them you can see the enormous pile of laundry in the chair in the background. Some of them are action shots of Chloe rubbing the noodles onto her eye. I don’t know why I was taking pictures instead of intervening. I imagine it felt therapeutic. Still does, actually! Love the cover! Would love a copy of the book. I have your book on audio but would really love a paper copy. It’s been truly an encouragement to me in mothering my littles. My husband and I recently adopted twin baby girls. Our older kids are all in their teens. I read this book and it has helped remind me of so many things and also taught me some things that I hadn’t even thought about before. I try to give this book to every young mom I know. I borrowed this book from a dear friend. It’s such a blessing! I would love to have my own copy to read again (and make my own highlights! ), and to loan out to other mommies of littles! I love this book… it’s what led me to this blog. 🙂 I’ll be giving a copy or two away to expecting friends this year whether I win the giveaway or not! I would love to win this and gift it to my niece who is recently a mother! Thanks for the give-away! I LOVE this book and would love to give a copy to my sister in law who is expecting her first! I borrowed this book from a friend and LOVED it! Would love a copy of my own!!! I already have a copy and LOVE IT, but I know several young Mamas in the trenches like myself, who would LOVE a copy too! I agree that taking pictures is theraputic. When our place looks like a bad dream and the toddler is running around eating nachos for breakfast (cuz we were too tired to put the bag away before bed) and there is a unique smell of morning diaper in the air, I find myself reaching for the camera thinking that I want to capture the moment for when I’m living with grown ups and everything is neat and tidy and maybe a little boring. And I enjoy seeing the spice of life all around our house too these days. Yes, please! I read it on my kindle, would love a copy for a friend! I love this book!!! It saved me from going crazy feeling like I was the only one! I borrowed it from my sister but I would love my own copy!! OO OO OO! Free book! I have been meaning to buy one for a friend! This book was SUCH an encouragement to me! We talk a lot about “milkshakes” and “spirited horses” and such! 🙂 Vey helpful!!! I’m going to have my first baby in about a month! Would love to have this book. I’ve already read it and given it away to a friend and one to my sister. Would love as copy, as “loving the little years” is something i really want to do! Love this book, and I have gifted it many times. Wish I had had it when my 5 were little. Would love to gift it some more. I lend out my copy of the book so often that it is rarely at home. If I had another copy for myself, then I’d never be without a good attitude-check in the house! A friend lent me this book and I’d love a copy of my own to reference! I’d love to win a copy! Thanks for doing a giveaway. I would love a copy to give to a type A co-worker with a new baby! So…I gave away my copy, and want to give one to a friend as a shower gift…I’d love one! Thanks for the give away, would love to win a copy! Please pick me!!!! I would love to win, have been needing to read this book! I gave my wife’s copy away to another mother who needed it. I would love to have a replacement copy for her (and myself). I’ve heard great things about the book! I’ve been wanting a copy if this book! I am due at the end of Oct with our first child and I would love this resource! I have 6 month old twins and a 2 year old. I could really use this book. A lot of times I don’t feel like I LOVE the little years. The picture reminds me of my life right now! Would love a copy! I’ve heard alot about this book and would love to own it. It sounds really good. I have 5 children, ages 1-8. Yay for give always! Would love a copy of this book. Yay! I’m sure I’ll be a mom one of these days, and I’d love a copy of this. I have heard great things about your book. I am currently expecting my fifth blessing and would love the mothering encouragement from your book! Thanks for your generous heart to be real.. with pictures! I gave my copy to a dear friend, but have often wished I had a copy on those really “challenging” days to gain a little perspective! Wonderful book!!! I would love a copy of this book! Thanks for the giveaway! I would love to pass along a copy of this book to a friend who is a new mama! I saw the picture of your little ones’ spaghetti faces…and that is the picture of my little guy two days ago :)Would love to read your book! Thank you. I have lent my copy out already numerous times to friends. Thank you for your honesty! Would love to win a copy to give to someone else. I’d love the book as we look forward to meeting our first child in about 6 weeks. I love your book and would be delighted to have a copy to give to another mom. Thanks for the giveaway! I’ve been told from different moms about this book. Would love to have it!! My sister let me borrow her copy & I loved reading it. My little girl is 7 months. Especially liked the part about not looking at the clock. With my next one that will be so helpful! I would LOVE to read your book. I have heard MANY great things about it!! I appreciate this book immensely! Would love another copy to share with a friend! I would love a copy! While I’ve never read it, I have heard wonderful things about this book. I am currently 21 weeks pregnant and have a very active 14 month old, so anything that will encourage me during these crazy times is most welcome! This book is on my amazon wish list! I would love to read it! I have heard so many great things about this book and would love to win a copy! looks like a GREAT book…….would love it!! I’d love for my wife to have this! I’m 23 and won’t be married for awhile, but the last 6-12 months I have been seriously questioning whether I even want kids for the first time in my life. I stumbled on this site last week and it’s given me so much hope that raising little kids well can be done, something that has had me in so much fear lately. Thank you! Looking forward to reading it some day! You are inspiring!! I would LOVE your book! My sister-in-law, Jessica Cummins, told me how wonderful this book is! I want to read it badly!!! With four little ones running around the house, I need a copy of this excellent book. I love this book! I read it once a month, and keep copies on hand to give at baby showers. My stash is gone, but I have several showers this fall, so would love a free copy. would love to know how to handle the day to day with patience, joy, and kindness…. This book as been monumental in shaping my mommying outlook! Thanks for being real! Have wanted to read this book for a long time. Would love to win it! Pick me!! Pick Me!!! Pick ME!!!! Thank you for your encouragement and honesty! I listened to the audio of this book and it was very encouraging. I would love a copy! I have wondered about that picture! I love the book and recommend it often. I would really appreciate any wisdom gained from reading this book! I have been wanting to read this book for awhile! I would love a copy! We have 12 month old twin boys and baby boy #3 due oct 2nd. I would love to win this book! I would love a copy to share with my sister. Wish my family and your family could get together and share a pasta meal together! Would love to give one to my sil she’s just starting out with her first little boy. This book is so incredible. Absolutely love it. Thanks for making the time to write it. Read it cover to cover the day I received it! It’s my go-to shower gift for moms on baby #2. I have heard such wonderful things about this book but haven’t had a chance to read it. Right now I could use some encouragement while my little ones are making messes all…day…long. 🙂 Thanks for the opportunity to win it! As a mother of two little ones, I would LOVE to have a copy of this book! I have heard wonderful things about it! Thank you so much for the opportunity! Love the matter-of-fact look on Titus’s face. This was not a new trick I think! Your book has been such a blessing, challenge, and encouragement to me. (I have four kids ages 1 through 6). I’ve already bought and given away several copies to friends and would love to bless another friend with this book! I loved this book when I borrowed it from a friend…would love to have my own copy to reference often as I, too, am in the trenches! I have been wanting to read this book! I have a little one & hope to have another one, so the little years in our house are not over yet! Thanks for blogging & writing! I’ve heard this is a great book! I have wanted to read this book ever since it came out. This is one of my favorite books to give away to friends. I loved it and still think of it a lot. I’d love to have another copy to give to someone else! I would love a copy…I haven’t read it yet, but many have recommended it to me. I gave both of my copies away! So please, pick me! Pick me! I want to read this and read it again. So much to learn. Your book has been full of helpful and wise words to me, would love to win one that I’d share with a friend! As I sit here sleepy-eyed at my desk at work after caring all night for my new little one, that picture makes me want to alternatively laugh and cry at the things to come! I think I need your book! My husband and I are fast approaching parenthood. I’d love to read this book to gain some Godly insight to raising our babies! I would love to have a copy to put in my high school library. I think all of our young women need this type of encouragement to live for God in their whole life. It would be such a blessing to be able to share this with them. Thank you! I keep my copy on the side of my couch and read it over and over again while nursing. It is so good!!! Thank you for the encouragement that you and your family are. Really appreciate it! Would love to read the book! I’ve been wanting to buy your book since I just had my first baby 2 1/2 weeks ago. Your book is my favorite new mommy gift to give. Would love to win a copy for my daughter – but grandma would like to read it first :). Thank you for the giveaway!! I would be thrilled to win a copy of your book! Would love to read this book. Expecting my first any day now! I love the cover, and would love to win! Love your blog, lvoe the book and love to give it away to weary moms, such great spirit and life giving food for Mamas. I would love a copy of this, even though mine are (sniff, sniff) leaving the little years! Thanks for doing this! I love the reality of this book, and how it points us to Christ continually. Yes, I would love a copy! I borrowed this book from a friend when it was my book club’s selection. I loved it!! I would be thrilled to have my own copy! My daughter-in-law and her friends have mentioned this many times. Our oldest is 25 and our youngest (6th) child is almost 5. I’ve learned much from these younger moms, many who have recommended this book. It’s high time I read it and then share it with others as well! A friend randomly loaned me this book about a year ago and I have been following you ever since! Would love my very own copy!! I have a couple friends who would love to borrow it, I’m sure! Your book has been on my “to read” list for some time now! I’ve heard from many it is helpful and encouraging! Thanks for this opportunity! Thank you so much for your transparency and your heart of encocuragement. Would love a copy of the book. I borrowed the book the first time I read it, and I would love to have a copy to re-read! I love your book, it is my favorite new mom read and I’d love to win a copy to give to a friend! my friend said this book was easily one of her top reads this year. i’d love to read it, too! This a wonderful book. I thank for the Lord for it and recommend it to everyone. It’s good because It makes me look at myself, for my own heart to be changed, before I focus on my kids’ behavior. So far I have purchased two copies of your delightful book. Then promptly gifted them to someone else! While I have read it I would love a refresher as baby #7 is due here in a mere 6 weeks. Wowza. Love Love Love this book.. I borrowed this book from my sister but would love to have a copy myself! I’ve already recommended it and want to give more copies away! I love this book! I am currently rereading it and am busy underlining it heavily. I would love to have a clean copy to share with a mom friend ir to give away on my book blog. I had 3 boys under 2 (now 4, 4, and almost 3), and your book shows me it can be done! I will not consider myself “overwhelmed!”(the chapter I read this morning) Thank you! I borrowed the book from my sis-in-law but would love to win a copy so I can re-read it! I’d love to enter your giveaway. I’ve been meaning to buy more copies for baby gifts. I would love to pass this gem onto another mom in the trenches of the little years! Thanks for writing this book!!! This is one of my favorite books and I would love one to gift to a friend! I’ve been wanting to read this book for months! I read the sample excerpt on my Kindle, and it was wonderful! I’ve heard lots of wonderful things about this book and would love a copy to read for myself! I would love a Godly perspective on raising kids. Love my copy…it has been loaned out, dogged-eared, underlined and written in. I would love to have a copy for giving away! Soo many names already… I am not a mom but an aunt to 9 lovely children. The youngest ones are a twin born only 3 weeks ago. I would love to give it to my sister in law, the mother of the twin. Maybe she can read it in bits and bites with her 4 children now (4y old boy, 2 y old girl and baby twin boys…) Seems a crazy live and added to that they are planning a mayor move to a total different culture in 6 months to work as tentmakers. Pffewww. I sigh already as I think of her life. But it is at the same time so beautiful and she is always so calm and gentle. Would love to give her this book! 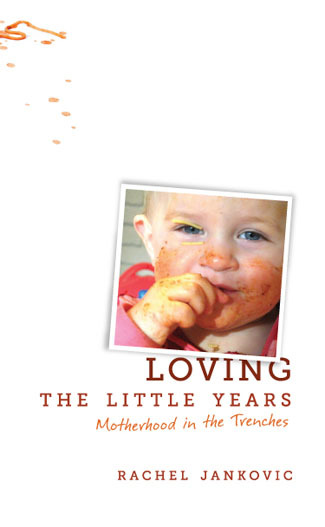 I have had “Loving the Little Years” on my reading list for a while and would love to win a copy! I borrowed a friends copy recently, and have really been enjoying it. Just this morning, after I read the first few chapters, I thought to myself, “this is a book I’d like to own”. I’m glad to see the book is so popular, since it’s my been pretty much my favourite book for quite a while now. There are lots of young moms in our church, so I’d love to have another copy to pass around. Thanks Rachel! Expecting my 3rd little one in a few weeks and would love the encouragement from your book! Love the blog! I have been searching for a copy of this book at all of our local libraries but have not been able to find one. I would LOVE to win a copy! Would love to read your book. Have heard so much about it! I really enjoy reading what you wrote on this blog. Would love a copy of your book. Thank you. Pregnant with our first- I love what you have to say on this blog, and I’m looking forward to reading your book too (whether I win it or not!). Yeah! I would love a copy, too! I’d love to have a copy to give away to a friend… I love this book! Would love to get this for my wife. my husband + I are in the process of adopting a little one from Africa. he or she (we don’t know yet!) will be our first child. I am so excited to begin the challenging, exhausting task of mothering a little one, and I’d love to have this book! Love all your posts, can’t wait to read your book!! I checked out your (this) book from the library right after it came out and loved it! I would love to have it on my shelf permanently though! What a great thing to give away! I have many friends who would love this book, so I would pass it on if I win. As a mother of a 20 month old and a 6 month old in a world where everyone thinks you’re crazy to have babies so close together, I find your family so encouraging! I love your book and would love a copy of my own! I absolutely LOVE your book. So convicting, encouraging, thought-provoking. You get the idea. Would love to pass it on to a friend. I have an absoultely amazing mentor who has more than once recommended this book to me.. I have not gotten a chance to read it, but everything she has ever advised me on, has been of incredible blessing! Just discovered your blog from another mom blog. Love it! Anyways, I’m entering the giveaway. Thanks! Love them while they are young. Too soon, just yesterday, they fly away and are gone. Love the blog…keep meaning to read the book. Thank you and you family for sharing. I’ve heard so much about your book and would love to read it! It sounds so encouraging. I have a very active 15 month old daughter and would love insight from another mother. I’ve been eyeing your book on Amazon, but I would love to WIN one! 🙂 Love the pictures. two kiddos under two in a third story tiny apartment. Yep! these are the trenches:) gotta love it! I have heard wonderful raves about this book! I have been longing to read it! Ooh! I would love to win a copy of this! I’ve been wanting to read it!! This is one of those books that require multiple reads. Thank you SO much for writing this! What an encouragement it has been to me. I would love a copy to give away. Thanks for the opportunity! Your blog is such an encouragement to me. I love your openness. God bless you and your family! I’ve been wanting a copy of this book since I first heard about it! I can hardly think of a book I would rather win. I have already bought one for my daughter, one for me (to read and to loan out) and have given a few as gifts. I know several young women wo whom I could give the ones I win! Thank you, Rachel, for writing so winsomely and so wisely!! Bless you! I loved this book so much that I recommended to every friend who could read English. I gave mine to a friend so I would love to win a copy. Love, love your book and would love another copy to give away to a friend :). Would love a copy! Borrowed it from a friend, loved it, but I want my own copy! Ooh ooh! I so want to read this book! Thank you for you and your family’s ministry. It blesses people in so many ways in which you all don’t even know! Your words have often encouraged and convicted me as a pastors wife to minister faithfully & with wisdom. Thank you! Baby #4 on the way and my oldest will be 4 1/2…sounds like a book I could use ! Would love this! Thanks for the encouragement! I have been wanting to read this book! I would love to win it! This is a wonderful book! I’d love a copy to give to a friend! I have a 3 year old and a 9 month old. I would love to read this book! Love your blog posts and would love to read your book! Have heard of the book once before and would be grateful to have the opportunity to read it and pass it on to other moms! My oldest daughter Sydney’s (4.5) horse, sparkle, stands & stares at the fence a lot. She’s gotten pretty good at letting me know when she’s about to bolt so I can help pull her back onto the path. Think we may need to buy some larger blinders before baby #4 comes in the next 2 wks! I would love a copy to share! The picture looks very real and makes me smile. I want to read the whole book soon, but recently read a few excerpts that were very timely. May you have a joy-filled day. I love how real you are! Look forward to reading your blog, can’t wait to read your book! Mom of two, soon to be three. I have been wanted to read this book for months, so I would love to win a copy! God bless you so much for everything you do! Another mom suggested that taking a photo rather than getting angry when my little one made a mess would be helpful in seeing matters from another angle. I remember my oldest asking me why I took a photo of her, at the age of one, playing with the box of Kleenex she had just emptied. Six more children has brought many opportunities, with varying degrees of success. Somehow mud has been a common theme throughout the years. My youngest just turned 9 years old today. Love the little years, they go by so quickly! and encouraging them in a loving way. I have 3 girls 5 yrs old and under and wow are my hands…busy! My oldest just went to kindergarten and it just seems like yesterday that she was born. I’m so afraid that I’m gonna blink and it will be her graduation day…or worse…her wedding day! These little years don’t stay around forever, but the memories do. Would love a chance to read this book that has such great reviews!!! I first read your “Motherhood is a Calling” blog and really related because I have 3 little ones 4 years and younger. I have been wanting to read your book for a while now. Thanks SO MUCH for sharing your experiences in your blogs! They have helped me tremendously, and I always look forward to reading your next one! Pick me! Pick me! 🙂 Loved your book, read it just after having my first baby and was convicted many times. My husband also discovered me reading it in bed when I was supposed to be sleeping and I was laughing so hard tears were running down my face and it took him several minutes to make sure something wasn’t wrong. Rachel, your book has been such a blessing to me personally, and is now blessing those I share it with here in Zambia where my husband, myself, and our two boys are ministering. I shared a quote from it at a Bible study recently with Zambian pastors’ wives, and listening to their feedback was so awesome. They deeply treasure truths from God’s word, and I was so encouraged to hear how those truths are changing them and their families. I hope you’re also encouraged to know that your book is blessing others around the world! Mom to a very active 10month old. Would love some encouragement on those rough days! I too buy this book for my friends with small children. You have impacted us way down here in the other end of the planet. My friend has just bought six copies to give to her “mums group”. I am just thrilled that it is a REAL photo of your REAL child on the cover. I am so encouraged by your words in the book and on this blog, and I am becoming (well, trying to become) a cheerful-hearted servant. I already own this book, but I’d love to win it to give it to some friends!! I have heard so many wonderful things about your book from my friends who have read it. I would love to have a copy of my own to read and share. Thank you for the give-away! Haven’t read the book, but would love to! From South-Africa and haven’t been able to get hold of it here. Smack bang in the middle of the middle years and your blogs have really been a huge encouragement and blessing! If this giveaway is open to residents of Canada (Ontario) then I would love a chance to win a copy! Like a broken record…I gave my copy away. It was too good not to share. Would to have my own copy again! I just yesterday discovered this website and will certainly be returning! I am in the throes of little ones, with another on the way, so would love to win this book. Thank you for the giveaway! I’m in the middle of this book and I love it! Love the photo and have heard it’s a great book! Hey there! I have been thinking about ordering your book as I am pretty sure raising children will require a less serious side. Our first little one is due the end of September! I LOVE your book!! It has encouraged me in so many ways and my six kids have benefited from me reading it. I don’t know, Rachel, the background in that picture still looks really put together. Thanks for helping us make clear distinctions as to what and who should be important in our lives! Love, love, love your perspective! I gave away my copy after being thoroughly encouraged–I would love another to enjoy and give away again! Haha! Love the pictures, Rachel! I lent my copy of Little Years to our neighbor. She said it totally encouraged her, but that her 3 year old took scissors to the cover and she felt like she needed to buy me a new one. It sounds like reading the book prepared her to deal with the demise of the cover! HA! Would love to win one of the books! Thank you so much for the giveaway! I’m going to be a first time mom in March… would LOVE your book! I own and have read your book several times, but I’d love a copy to give to one of my sisters-in-law! mine has been given away and I would love another! This is such a good book, I would love one to give away… and I absolutely love your full photo disclosure. Reminds me of my three old twins today eating pb and honey and deciding they might just get down and run directly to the couch and put their sticky icky faces smack down on the seat cushion. Believe me, I was not taking photos, rather, running after…. ha! I have a 3 yr. old and a 6 mo. old and just read your article on John Piper’s website and LOVED it. It was so encouraging how you spoke on applying the Gospel in everyday frustrating situations with the littles! I would love a copy of your book!!! I have a copy for myself, but would love to give one to an expecting mother-to-be! I am totally in the trenches! Just had #4 so that makes 3 under 3 and a 6 year old! Sounds like something I need to read. I have loved reading this blog and would love to have a copy of you book. Thanks so much for sharing!!! I would love to win a copy :)! I already have a copy of the book for myself, but I would love a copy to pass along to one of the many women I know who would love to have a copy of their own :)! have been wanting a copy for a long time! thank you! I have this book and LOVED it! Thank you so much for writing it. Would love to win another for gift or for our MOPS library. Thank you! I love this book, especially the part where you talk about the “bulk effect.”. I would love to be able to give on to some of the first time moms that I mentor. I just discovered your blog and your book. I’d love to win a copy! I am a new stay at home mommy to a 3 year and 6 month old. I would love to read this book. I have heard such wonderful comments about it! I also recently discovered your blog. I’m very interested in reading your book! I would love to win a copy! I gave my copy away. Here is to getting one for me and two to for friends! I would love a copy of this book. We have a 15-month-old son, and hope to have a few more kids.. I’ve heard great things about this book. Your writing was recommended to me recently. I would like to win your book in order to read more and receive encouragement! I have been so encouraged and challenged by this book! My copy has been passed along to various friends and I would love another to re-read. You make me laugh and cry at the same time. Appreciate the blog, and would love a copy. My baby girl just turned one so I am just entering the toddler stage. We want a big family so I have many years of motherhood in the trenches ahead of me! I would love to read this book! I’ve been wanting a copy of this book. Winning it would be wonderful! I have your book on my “to be bought & read list” so a complimentary copy would be lovely! 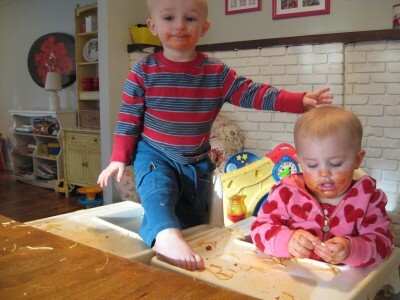 Thanks for sharing the rest of the picture, the little foot crossing trays to be part of his sister’s mess is just great. I have three little blessings so far, close in age. I am a new Christian (about 2 years since I was saved) and I still struggle with a residual prideful attitude and short temper. I have absorbed much wisdom from the Wilson bunch from this blog and would love a copy of your book! I have been meaning to get this on Kindle, but I’d really like a hard copy more! I’d love to win a copy, I’ve heard wonderfulr things about this book! Can’t tell you how many times this blog has been God’s grace to me! Keep it up! I’ve been hoping to get this book sometime! I just had my first baby, a little girl, 7 weeks ago today! So I’m entrant number one hundred and something…? Excellent resource! I just came accross this blog and loved it! I will definitely be adding it to my Favorites webpages fore asy access. I would love to have the book too! Really enjoyed this book and gave it to a friend to borrow who has an almost 2 year old and 6 month old twins. Would love another copy to be able to give away! I’ve been wanting a copy of this book, but haven’t wanted to take the money out of our tight budget! I have a two year old and I’m loving it, but having to work full-time right now makes it incredibly stressful. Would love some encourgement and guidance in parenting my little one! As a new mom, I’d love to have a copy of this book!! Id like a copy please. Love this book! I read it often; it always seems like a timely, encouraging reminder! I have given away several copies of it as well. Would love to win this! Woo hoo! I’d love a copy! Yes please! I think I could really use reading a book like this right now! Truth is, I already have the book. I love it. I even wrote the word “absorb” on my refrigerator board so I can remember your illustration of the racquetball court. But I would love to win this for one of my MOPS pals. This would be a great study for the group. Thanks for all your posts and books! Would love a copy! I always love your postings. I loved this book! I have 7 kids 9 and under and it was a blessing to read someone who was raw but fresh all at the same time! I would love to share a this copy with another mommy! A friend lent me your book and I read it twice before I had to return it. I would love to own a copy! Thank you for doing a giveaway! Pictures to make a heart smile. Loved your book and continue to go back and read chapters of it again. I have a friend who is expecting soon so if I won a copy then this is where it would be heading. i already have this book so dont enter me into the giveaway. but just had to tell you how lifechanging it was for my parenting. and it came right when i was really enjoying being a mother to my young children. what a timely and wonderful book it was and still is for me!! Although I am almost done with the little years, and I have had various in and out cycles with those since I have 5 kids aged 15 to 2, I am still rather interested in reading this book. Baby #4 is 2 weeks old. Would love a copy! I really enjoyed this book on audio and would love to highlight a paper copy, or pass it on to a friend. A real encouragement to Moms trying to love the little years. Our 5 kids are 8, 6.5, 5, 3 and 1.5. Thanks for your transparency and great ideas on how to not just survive, but actually enjoy this busy season. How quick it is going by. God bless your ministry. Would love a copy–love the cover and the content. would love to have this book. i have 3 kids. all under 4. Thanks for the give away. I hope I win! Here is my comment. 🙂 Thanks for all that you share on here, ladies! Rachel! I have been reading your articles on Desiring God and your posts on Femina for the past few weeks! I am a new mom (my boy is 5 1/2 months now), and have been deeply encouraged and spurred on in this new season by the Lord, through your writing. Thank you for taking time to share your giftedness! I pray that the Lord will widen your community of readers, so that many more might know the joy and sacred position of being a mother- how you so graciously portray it. Grace & peace, my friend. I would love to read this book; seems like all of the mamas I know and respect in my life have read it and love it. The cover photo was perfect! The book was excellent too. I’d love another copy to give to a friend. I never leave comments, but an exception is necessary to have one of these decorating my bookshelf! I would love a copy of this book. I have three children who are ages three and under. I need some encouragement and wisdom from a mom who’s been there (or who *is* there)/done that. Thanks! Would really love this book to read again and share with the amazing mothers in my life! I’ve had this book recommended so highly and I’d love to read it! I read this book a while ago while nursing #4. It was such a great perspective! It’s Monday, am I too late? I had a copy and gave it away. I’d love another one and free fits the bill.. Started the little years of my life over twenty years ago. And now, the Lord saw fit to have me going through another set of little years. Can’t wait to read this book! Would love a copy of your book. My friend let me borrow her copy, and I very much enjoyed it.